Hey! Ya wanna make some money? 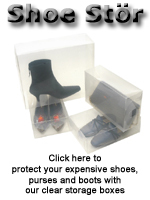 Unlike Shoeguy, affiliates of Shoe Stor earn a 10% commission off of every sale they send to Shoe Stor. Commissions are paid quarterly. "This weekend, New York joined the ranks of six other Northeastern states by eliminating sales tax on all clothing and footwear valued under $110 dollars. It's a legislative budget move that is being hailed by both shoppers and businesses."